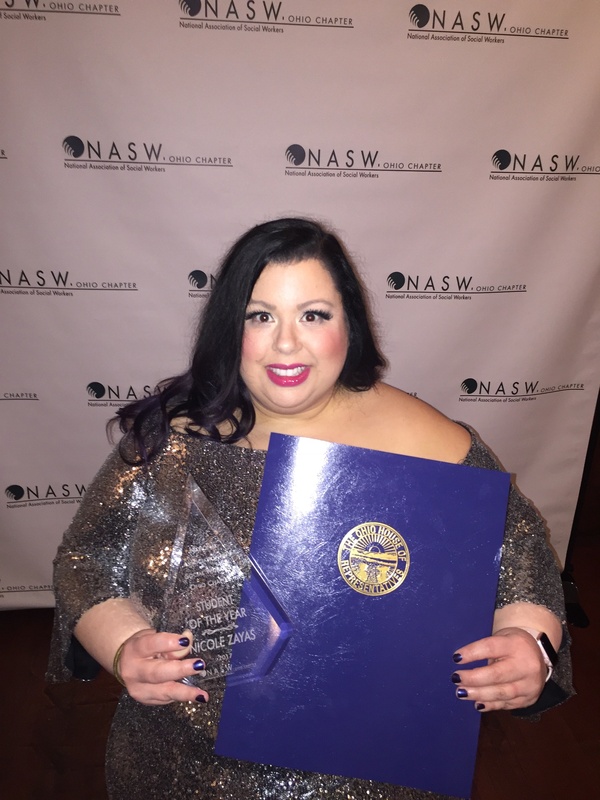 Nicole Zayas was recognized as Student of the Year by the National Association of Social Workers – Ohio Chapter. She has received bachelor’s degrees in psychology and Spanish at Youngstown State University in 2008 and is currently seeking a Master’s of Social Work degree at YSU. Zayas said as a first-generation college student, being named the Student of the Year was a huge accomplishment for not only her, but everyone around her. She said she puts her time and effort toward various kinds of social work. She has an internship at Ohio State Penitentiary to provide mental health services and therapy. Zayas is employed as a performance facilitator specialist for the Mahoning and Columbiana Training Association, where she is the agency’s official Spanish translator. She said since childhood, her parents have taught her about caring for social justice, rights for Latinos and the LGBTQ+ community, equality and wages. Zayas said she volunteers with the Youngstown Pride Festival, helps people find employment and is engaged in bringing cultural awareness to the Youngstown community as vice president of YSU’s Latino Organization. She said it is important to empower people. “I care very much about other people and the problems that they have, and I wanted to help them,” she said. Although she has to manage a tight schedule, Zayas said she still has enough sleep every day. She goes to bed at 10:30 p.m. and gets up at 6 a.m. every day. “I have to make sure that I can give a 100 percent everywhere I am,” she said. “Doing social work is caring for others, but in order to [do so], you have to also care for yourself,” she said. After graduating this May, Zayas said she wants to be a therapist. “Going to graduate school seemed like something that was very far out of reach that I could never accomplish … I had to come to this conclusion on my own,” she said. She is a member of Alpha Kappa Mu National Honor Society and the YSU Social Work Honor Society. She is also the president of the Youngstown Area Community Theatre Alliance, which is promoting theaters and gathering scholarships. Robert Dennick Joki, who has been friends with Zayas for 15 years, said he was not surprised by her accomplishment. He said Zayas has always been someone who is eager to help others. Since Zayas started attending to YSU, he said she has been able to use her education to better support others, something she has always wanted to do. Joki said he is excited to see where Zayas goes from here. Zayas was named NASW Ohio’s Region 4 Student of the Year previously.